Nvidia is deepening its bench in terms of gaming devices, and the new Shield Tablet is an impressive new addition to the roster. While you’ll note some trade-offs in terms of the size and weight of the device versus the trend towards ever-slimmer, lighter gadgets, it’s a powerful tablet, and a powerful value proposition, even if gaming isn’t your central concern. The new Nvidia Shield Tablet is a surprising device, in that it feels like one of the best hardware designs I’ve ever held in an Android tablet, and yet it wasn’t made by a company with a long track record of building these kinds of devices – Nvidia is still, first and foremost, a chip- and graphics card-maker, and while it has built a Tegra K1 reference tablet before, this is still early days for its hardware business. Despite that, this tablet is thoughtfully designed. It’s not the sleekest slate on the market, and at first its thickness and weight might lead you to believe it’s something from a couple of years ago, but the construction actually feels more solid than dated, and the weight betrays its high-end gaming pedigree. The internals Nvidia used here allow the Shield Tablet to pull off impressive graphical feats, like running games at full HD resolution on the tablet itself, and outputting 4K content to compatible external displays. Nvidia’s design choices also include a front face look reminiscent of what HTC has done with its One line of smartphones, but with full-length speaker grills spanning both top and bottom that allow for built-in stereo sound that’s a cut above what most mobile gadgets will provide. The Nvidia Shield Tablet is still mostly plastic (don’t let those chamfered edges fool you) but it’s plastic used properly, as with the matte, slightly rubberized back that lets you keep a grip even while in the most white-knuckle gaming sessions. Nvidia’s Shield Tablet cover accessory, which is an optional add-on, magnetically locks into place like the iPad’s Smart Cover, but does so with a lower rate of first-try success. It has actual physical recesses in the tablet for connectors on the cover hinge to insert into, but these missed on most initial attempts when I was connecting the accessory. It’s not a huge deal: resetting them properly will take you an additional four seconds. Once on, however, the folding cover design works to prop up the tablet for controller-based gaming sessions. The Nvidia Shield wireless controller is also well-crafted, with a control scheme that will feel familiar to any Shield Portable owner, and basically to anyone who’s ever used an Xbox game pad. Because it doesn’t mess around too much with the formula for gamepad layout, it’s easy to pick up and play without any kind of learning curve. The touch-sensitive start, back, home and Shield launch buttons would be better as actual mechanical switches in my opinion, but the touch-sensitive pad at the bottom is really useful when stuff isn’t perfectly controller-optimized on Android. The Shield Tablet has a long list of features, many of which have been made available to Shield Portable (the controller-based handheld that marks Nvidia’s first foray into Android-based game hardware) owners either via updates or as part of the original package. Among these, the most impressive for gamers are GameStream and Console Mode. GameStream lets you use a gaming PC with a GeForce GTX-series graphics card to stream your full PC titles directly to your Shield Tablet over your local wireless network with extremely low latency. The requirements for admission are high: GTX series graphics cards aren’t cheap, and the PC needs to have at least a Core i3-2100 processor clocked at 3.1GHz, or an AMD Athlon II X4 630 at 2.8GHz or above, with 4GB of RAM, Windows 7 or 8 and an 802.11n dual band rounder recommended for best performance. My own review rig for GameStream testing holds a new Nvidia Maxwell GTX 980 graphics card, and my network environment uses a current-generation Airport Extreme with 802.11ac for wireless communication. GameStream thrives under those conditions (so long as I’m connected to the less noisy 5GHz band, as the 2.8GHz frequency is jammed with wireless devices in my gadget den nightmare office). But the result is amazing, letting you essentially pull off full-scale gaming wherever you want around the house. Console Mode means that you can not only experience true gaming on a mobile device wherever you want, but you can also turn it into a big-screen experience. My gaming rig is currently plugged into my main TV, but sometimes I’d much rather game in the office, and the Shield Tablet is perfect for that. Using just a mini-HDMI-to-HDMI cable, I can be gaming in no time, and using the Shield Tablet as a full-fledged Android-powered media center, thanks to apps like Plex and Netflix. Native Twitch integration makes for super easy streaming of your Shield Tablet gameplay, which is going to be a big boon to the growing number of mobile players who are getting into that kind of broadcasting. Even though the LTE version I reviewed came with an AT&T sim for data, I was able to swap out my own Telus one for use here in Canada, and it worked instantly. Speeds over LTE were great, and using the remote GameStream feature in beta to play while away was impressive – but also data heavy. The LTE option is definitely a nice upgrade incentive for the $299 model, however, especially when you factor in that it also provides double the storage space. Shield’s gaming tablet is predictably powerful, given its mission and function. You’ll find it provides butter smooth performance on even the most demanding Android games, and is especially impressive on those that have been Tegra-optimized. It makes the entire Android experience better as a result of its processing muscle, too, and that’s something Nvidia makes even more apparent by keeping the whole Android edition pretty much stock, without the usual bloatware and skins included by many OEMs. Streaming performance is also very impressive, with almost no noticeable lag in most conditions, nor much in the way of graphical deterioration when your network conditions are optimal. The SHIELD controller helps things out with latency by connecting via Wi-Fi instead of Bluetooth, leaving no perceptible delay between input and response. I was able to play Shadow of Mordor, Skyrim, Deus Ex: Human Revolution and a number of other games over GameStream without issue, and without feeling like I was missing anything from the desktop version besides more visual space. In terms of performance, the only real issue I had was that without the Shield Wireless Controller, the tablet is essentially useless for most GameStream applications, which is a huge part of the platform. You can use Bluetooth controllers, and mice and keyboards to control software, too, but the Wireless Controller is really an essential part of the package, which means you need to factor in an additional $60 on top of the purchase price to arrive at the true final cost for the device, plus the cost for the cover at $40. The other thing that isn’t great, but isn’t terrible either is the DirectStylus 2. It comes with the Shield Tablet, and slots into a storage space on the back, but it displays noticeable lag when used even with Nvidia’s own built-in Dabbler drawing app, and its unique design isn’t the best I’ve seen in a touchscreen stylus. Still, it can do the job for handwritten notes, and my guess is that most people using this device will mostly just keep it tucked away in the storage slot anyway. Nvidia’s work on the Shield Tablet’s display are what help elevate this from just another Android tablet to a full-fledged mobile gaming console. The display’s generous 8-inches feel like a big screen TV when compared to the Shield Portable, and the resolution means you’ll sometimes forget you aren’t playing your PS4 at home when you’re using it on the go. The pixel density of the screen means text renders crisply, too, and it’s great for watching movies or videos. It’s not the best display in the mobile industry, however (the iPhone 6 Plus currently holds that crown in my opinion, with better color rendering than this device) it won’t disappoint any but those with the most exacting standards. Auto brightness is subject to the same inconsistencies that affect most Android devices in my experience, but when used in manual mode, higher brightnesses are suitable for most viewing conditions. Nvidia has also redesigned its Shield Hub software recently in such a way that complements this larger screen and landscape orientation, so you really will feel like you have a personal, portable TV and media center all-in-one when using this on the road. With great power comes great responsibility, and in the case of mobile devices, great battery draw. The battery life on the Shield Tablet lasts around a full day under normal mixed use, but when you’re streaming or running even demanding Android games, you’re going to burn through it a lot quicker. Even with dedicated, continuous gaming use, however, it’s at least on par with devices out there like the 3DS and the PlayStation Vita. Nvidia’s Shield Portable is a great device, albeit with limited appeal. The Shield Tablet broadens the appeal of a mobile gaming gadget, since it also operates as one of the better Android tablet options out there currently, at a price that’s very competitive given the features it includes. The core audience for this device is still going to be gamers, however, and that’s no bad thing. Console and PC purists might still find reason to compare this device negatively to their PS4s, Xbox Ones and Alienware desktops, but it’s light years ahead of the rest of the mobile market when it comes to dedicated gaming hardware. GameStream especially goes a long way to bridging the gap between the core games market and the tablet realm. 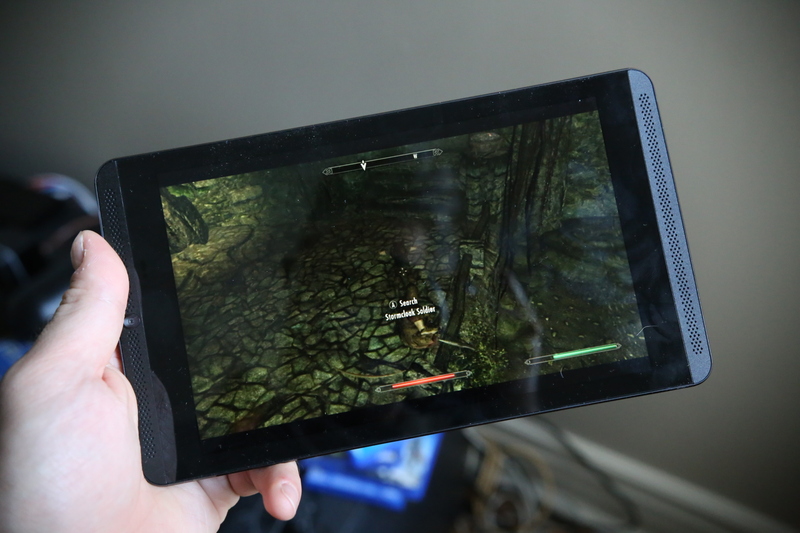 If you’re looking for an Android tablet, even if you don’t really consider yourself a gamer (but you at least enjoy games), give Nvidia’s device a serious look; while Google has typically delivered solid experiences with Nexus hardware like the Nexus 7, Nvidia is keeping costs relatively low while also pushing the boundaries in terms of performance and use cases, which are benefits any class of user can appreciate.